Rate hikes could come again for Sitkans — but probably not for at least a year. 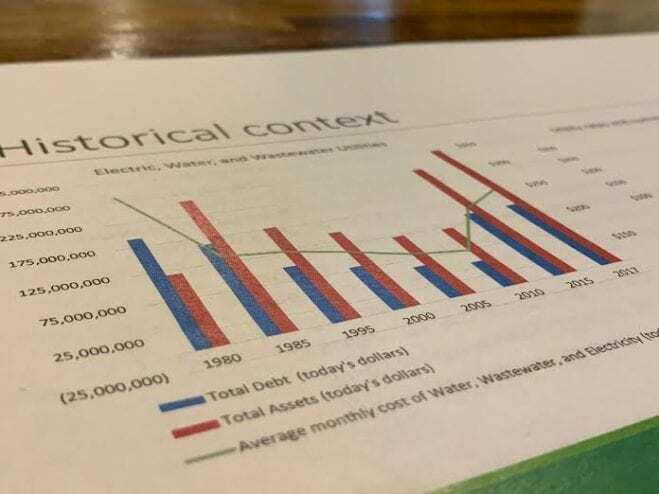 At a special budget meeting on Thursday (1/24/19) the assembly heard three options for new rates in the major enterprise funds: electric, water, wastewater, solid waste and harbors — for 2020 and beyond. With the electric fund, the first plan would see no increases in 2020, with a 2 percent inflation increase the following year and thereafter, amounting to about $4.95 a month for a household using 1500 kWh (kilowatt-hours) per month. The second plan would increase electric rates by 3 percent in 2020, 2 percent thereafter. The third plan would also not increase rates in 2020, but push them up by 2.5 percent in 2021. City staff said that choosing option one, while giving Sitkans a year off from the rate increases, would mean the city could risk not meeting its bond covenant. In order for it to work, Chief Financial Officer Jay Sweeney said the city was banking on a few things happening. But Mayor Gary Paxton thought the city should take the risk. Assembly members also paid special attention to the harbor fund, which could see the steepest rate increases. With major infrastructure improvements planned for the future, including the complete replacement of Eliason Harbor, a project with an estimated cost of $30 million planned for 2032, there is high need to increase working capital in the fund. One of the options proposed would raise harbor rates by 6.3 percent every year from 2021 through 2036. Paxton voiced concern at that number and Sweeney said the staff had considered other options to reduce rate increases, including the privatization of one of Sitka’s harbors. Sweeney said that the downside of privatization- those that use the harbor would be subject to private industry dictating the harbor operations. And assembly member Kevin Knox wondered if, rather than privatization, subsidization from all households in Sitka could be an option. Knox says the harbor commission doesn’t know exactly what that subsidization would look like, but he thinks the assembly should consider it moving forward. The assembly took no formal action following the budget presentation. They’ll meet again next Thursday (1/31/19) to set a course of action.